Note from shop owner Thank you for checking out our Etsy shop. We are currently closed for orders until mid May. Thank you for checking out our Etsy shop. We are currently closed for orders until mid May. Happy with final product. Responds very quickly with emails. EXCELLENT quality! Very pleased!!! Look forward to ordering from them again! Absolutely perfect! Exactly what I was looking for. It’s perfect in our travel trailer. What a perfect way to describe marriage! 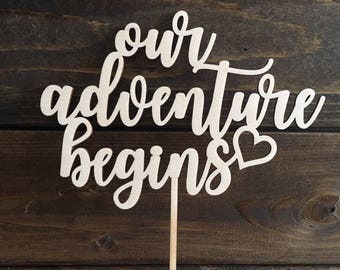 It sure is an adventure!! Engraving kids drawings and writing is our new favourite thing!!! What an amazing way to keep a piece of their artwork! Looking for a family sign? We can turn your idea into a beautiful creation! We would love to make you something special for your big day - and our cake toppers are becoming more and more popular! Located at the footsteps of the beautiful Rocky Mountains in Calgary, AB, Rider's Rustic Woodworking is run by a husband and wife duo. Our love for woodworking started when we decided to create a few small DIY decor items for our own home. Little did we know how much interest we would receive from our family and friends. Shortly after Riders Rustic Woodworking was born! We have a deep passion for sharing our wooden creations with you. Our designs are inspired by many of the things we love - our children, our pup, family, friends, mountains, camping, outdoors, travelling, wine and humor. Thanks for visiting our shop and we hope you have a fantastic day. Product dimensions and sizes are approximate. We do our best to match dimensional specifications as advertised, however due to our nature of our production process and working with wood, there may be slight tolerances in the final product. Due to the nature of woodworking and the materials we use, our product will vary slightly due to wood color, wood grain, laser smoke patterns, imperfections (ex: knots) or wood discoloration (some maybe be lighter and some darker). This makes each item unique so no two items are identical. When we purchase the wood from a local wood shop, we go through each piece to ensure we buy the flattest boards - however since wood is not perfectly flat, there may be very minor warping. If you have a design idea or specific quote you'd like to see, we would love to hear from you to discuss a custom orders. Please contact us at ridersrusticwoodworking@gmail.com or message us through ETSY. For wholesale inquiries, please contact us at ridersrusticwoodworking@gmail.com or message us through ETSY. Some items are photographed outside for natural lighting purposes but are not treated for outdoor use. We recommend at least two coats of outdoor rated polyurethane finish for items if you intended to use or display outside. We cannot treat them with polyurethane in our workshop. Also note that finishes can change the appearance of our items, so adding stain or paint once the product is received is at the buyers own risk and discretion. Riders Rustic Woodworking cannot be liable for any personal injury or damage in addition to property damage resulting from our products. All items provided by Riders Rustic Woodworking is to be used at the buyers own risk. Local pick up is available in NW Calgary free of charge - use the code LOCALPICKUPYYC! Once your package is dropped off at the post office, we cannot be held responsible if your item is broken or damaged while in transit, or if it is delivered late. We will do our best to work with you if you would like a second item shipped due to damage during shipment) (shipping will be paid for by the customer) and we will deal with Canada Post regarding the damage (no guarantee of a refund). We ship your package to the address you enter on Etsy. So please make sure it is entered correctly. If your package is returned to us due to the address being incomplete/incorrect, the additional shipping charge will be the responsibility of the customer. Currently we do not paint our signs. We love the fact that our customers like natural appearances or paint the signs themselves. We are always excited to see photos of our products after our customers have mounted or finished them! We use laser technology to help create our products and use high quality wood products. We love the outdoors and our environment so we use a four stage filtration system that purifies the air during production. We use the laser to engrave and cut through the wood however there may be some small spots where the laser is unable to cut all the way through. In those instances, we will manually cut through the wood and finish the edges ourselves to match the rest of the sign edge (dark brown). Each order is hand sanded (without the use of power tools) with love and care.